If you spot this vegetable at the supermarket, don’t be put off by its stout thick stems, because looks can be deceiving. This Asian green leafy vegetable, known as Gai Lan or Chinese Broccoli, is often featured in Chinese restaurants and actually cooks very easily. Nutrition-wise, this vegetable is a good source of nutrients such as calcium, vitamin K, potassium, vitamin A, fiber and folate. 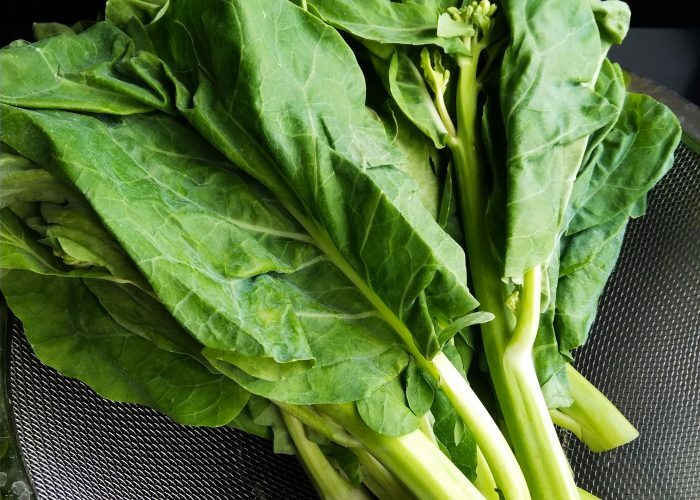 One cup cooked (88 grams in weight) of Chinese Broccoli would provide 88 milligrams of calcium, 230 milligrams of potassium, 87 milligrams of folate, 75 micrograms of vitamin K, 1441 International Units of vitamin A and 2.2 grams of fiber. When cooked, this vegetable’s stalks often yield a pleasing crisp and gentle crunch. The key to a delicious vegetable side dish is in picking a tender young batch of Chinese Broccoli at the grocery store. Look for fresh looking green leaves, tender stalks (with no dry or crusty ends) and flower buds that are mostly still tightly closed. Then bring it home to store in the refrigerator and cook it within the week. After washing and removing the last half inch off the ends of the stalks, Chinese Broccoli is often either blanched for a few minutes in hot boiling water until tender or stir-fried quickly in the wok, before being eaten whole bathed in an oyster sauce or soy sauce-based mixture. In either method, use a fork to pierce the stems during cooking to see if the stems are cooked through. If you are stir-frying the Chinese Broccoli, sauté some garlic and ginger pieces in a bit of cooking oil first before adding the whole Chinese Broccoli pieces. Then after cooking 3-4 minutes, remove the Chinese Broccoli from the pan onto a large serving plate. Into the pan, add a bit of soy sauce (or tamari sauce) to the remaining garlic and ginger infused oil, or used a bit of oyster sauce instead. Mix this ‘sauce’ until combined and then drizzle it on top of the cooked Chinese Broccoli on the plate. You could also make this ‘sauce’ to pour on top of the blanched cooked Chinese Broccoli. Enjoy! Broccoli, Chinese, Cooked – Nutrition Facts & Calories. SELFNutritionData. Accessed July 13, 2018.